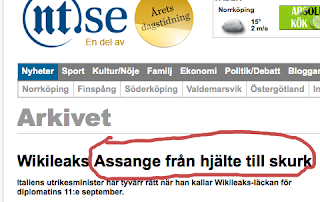 Professors blogg: Julian Assange, "From Hero To Villain" VS "From Villain To Hero"
Stockholm: Leading paper Dagens Nyheter did run on 22th of June an editorial on Assange titled "Not A Hero Or Victim". 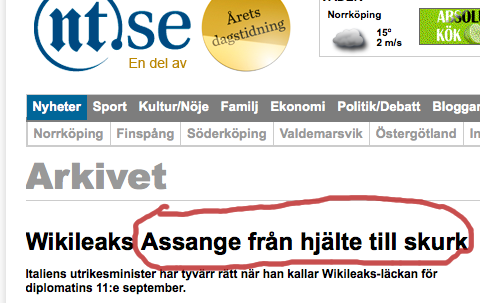 A main argument put forward by DN - as also repeated in BBC by Christian Christensen (an American researcher and now professor of media at Uppsala) is the U.S. propaganda trick of presenting a purported Assange’s "contradicting" attitude by seeking asylum in a country criticized - as DN put it - "for silencing" the oppositional press. 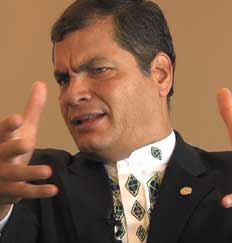 In concrete, the "confrontation" it has been about injurious or libel articles in some oppositional press which the government had denounced to the courts of justice in democratic Ecuador, leaving the independent justice system to assess the criminal character of such political motivated smear. "Make no mistake, since the invention of the printing press, "freedom of the press" - in quotes - responds to the will, caprice and bad faith of the owner of the printing press. I propose that we fight to open the real press freedom, which is part of a larger concept which includes the right of all citizens to freedom of expression"
Finally, "From Hero To Villain" VS "From Villain To Hero"
In the line of DN ad-hominem characterizations of Assange, several MSM papers in Sweden, including State-owned media apparatus, have headed their editorials or articles, "Assange From Hero To Villain" ("Från hjälte till skurk"). In Ecuador, however, Hoy run the same day an article headed "Assange From Villain to Hero"